I love my sleek, modern carbon-frame bike. I’ve got a Garmin cycling computer and a heart rate monitor, both of which I use religiously when I ride. I upgraded the wheels on my Trek Domane 5.2 to carbon-fiber Shimano C24 wheels. I wear cycling clothing, a current-generation MIPS-based cycling helmet, and use clipless pedals. 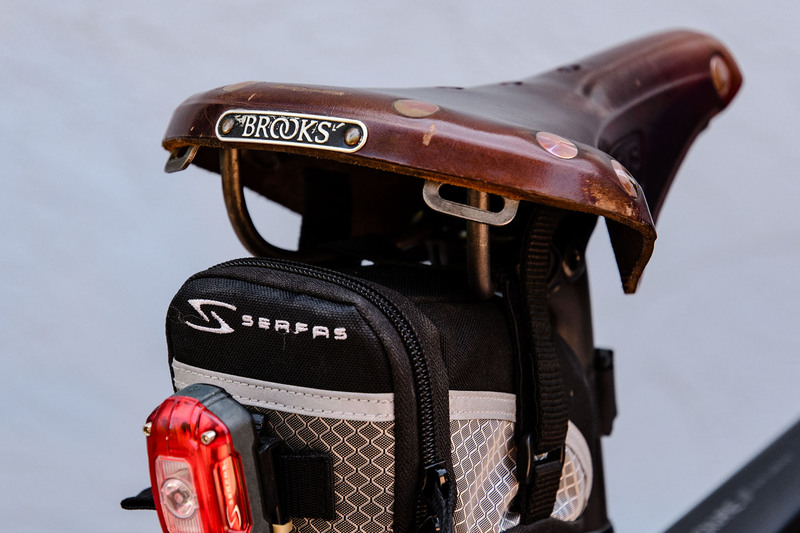 When it comes to bicycle saddles, though, I’m decidedly old-school. 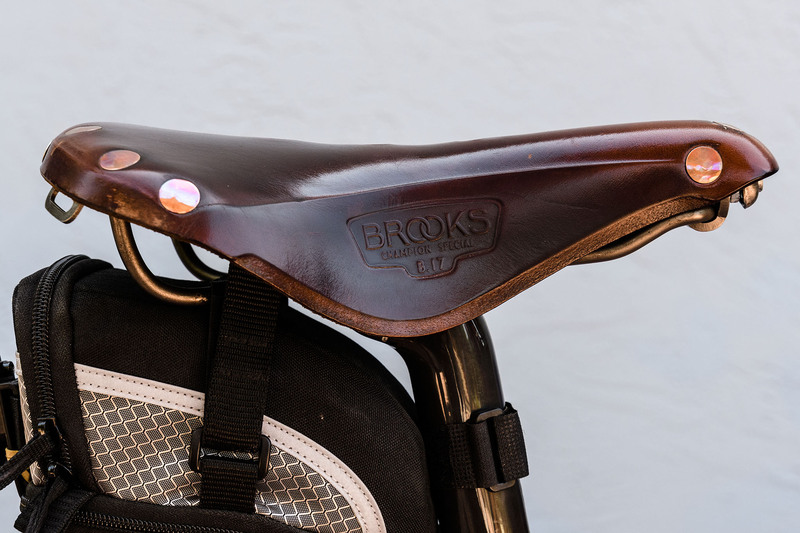 I discovered Brooks saddles quite by accident — the bike I rode everywhere as a college student came with a B17. That bike and saddle have been lost to the mists of time. When I began riding regularly again about a dozen years ago, I rode on a padded Trek saddle installed on the Giant OCR1 that served as my regular bike at the time. It seemed okay at the time, but I’d notice my hips and sit bones getting a little tired at the end of any ride longer than about 20 miles. I eventually upgraded to my first carbon-fiber frame when I bought a Felt Z5. The Felt saddle’s hard plastic proved to much for my bottom, even with padded bike shorts, so I cast about for a different saddle. I didn’t want to return to that over-padded Trek saddle. I then recalled the leather saddle I used years before. So I bought a black leather, Brooks B17 Standard with chrome moly rails. I put a lot of miles on that saddle through two bikes, then gave it to my daughter, Elizabeth, who used it in her epic cycling journey across the US. When I shifted to the Domane 5.2, I picked up a titanium-frame B17. The titanium rails didn’t lighten the saddle by much; the B17 Ti weighs in at 540 grams, or over a pound. Most modern racing saddles weight as little as half that. In addition to weight, people often complain about the break-in time required for leather saddles. I’ve been riding this B17 from day one, and it’s been comfortable from day one. Yes, the leather’s gotten a bit more pliable over several thousand miles of riding, but I never experienced the break-in pain others talk about, at least not with the B17. I attach the saddle with the nose up about 1-2 degrees. It seems to ride more comfortably at that angle. I get teased about using the Brooks on the Trek carbon-frame Domane fairly often. I’ve even been accused of being some kind of cycling luddite, but really, I’ve tried a lot of saddles. The B17 continues to win out on sheer comfort. So if you see someone riding on a sleek, black Trek Domane carbon-fiber bike with an antique-brown Brooks B17, it’s likely to be me. Feel free to pull up and say hello, but no jokes about the leather saddle, please. I’ve probably heard them all, and it’s unlikely anything you say would change my mind.